This season's Solstice (Winter in the Northern hemisphere, Summer in the Southern), occurs at 23:38pm UTC on December 21, 2008. That's 5:38 PM tomorrow evening where I am, in the Eastern Time zone. The name is derived from the Latin sol (sun) and sistere (to stand still), because at the solstices, the Sun stands still in declination; that is, its apparent movement north or south comes to a standstill. This year's Winter Solstice is remarkable for an unusual astronomical coincidence: The lunar eclipse occurring later tonight, early tomorrow morning. I've seen a range of reports on the last time this occurred, from 372 to 645 years. According to Wikipedia, the last time this occurred was in 1638. Whatever, it's in centuries, so rare enough for my lifetime. In the New York area, the eclipse will officially begin on December 21 at 12:29 am as the Moon begins to enter Earth’s outer, or penumbral, shadow. But even in clear weather sky watchers will not notice any changes in the Moon’s appearance until about 1:15 am, when a slight “smudge” or shading begins to become evident on the upper left portion of the Moon’s disk. The first definitive change in the Moon’s appearance will come on the Moon’s upper left edge. At 1:33 am the partial phase of the eclipse will begin as the Earth’s dark shadow–called the umbra–starts to slowly creep over the face of the full Moon. At that moment the Moon will be roughly two-thirds of the way up in the sky as measured from the southwest horizon to the point directly overhead. At 2:41 am the eclipse will reach totality, but sunlight bent by our atmosphere around the curvature of the Earth should produce a coppery glow on the Moon. At this time, the Moon, if viewed with binoculars or a small telescope, will present the illusion of seemingly glowing from within by its own light. At 3:17 am the Sun, Earth and Moon will be almost exactly in line and, assuming clear skies, the light of the Moon will appear at its dimmest. Totality ends at 3:53 am, and the Moon will completely emerge from the umbra and return to its full brilliance at 5:01 am. By then the Moon will have descended to a point about one-quarter up from above the west-northwest horizon. The Japanese Hill-and-Pond Garden was another station on my tour of the Brooklyn Botanic Garden on Veteran's Day with Blog Widow. What's the connection between Veteran's Day and BBG's Japanese garden? Its designer, Takeo Shiota, died in a U.S. internment camp during World War II. 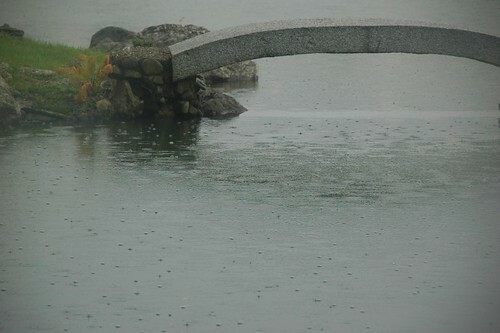 There are different styles of Japanese gardens. The hill-and-pond style is intended to be viewed from a fixed point, in this case, the pavilion that reaches out over the shore of the pond. 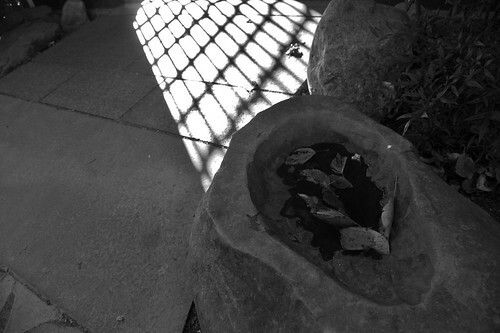 The stone basin above adorns the entrance to the pavilion. It is a blend of the ancient hill-and-pond style and the more recent stroll-garden style, in which various landscape features are gradually revealed along winding paths. The garden features artificial hills contoured around a pond, a waterfall, and an island while carefully placed rocks also play a leading role. Among the major architectural elements of the garden are wooden bridges, stone lanterns, a viewing pavilion, the Torii or gateway, and a Shinto shrine. The steep hills, representing distant mountains, are a maintenance nightmare: they cannot be mowed by walking a mower across them. Instead, the mower must be rigged to bypass its safety features, and carefully lowered and raised down and up the slopes using ropes controlled from the tops of the hills. BBG staff are gradually replacing the turf of the original design with slow-growing dwarf Ophiopogon, Mondo grass. These will eventually provide the same scale and texture as lawn without the hazards to life and limb. One of the treacherous slopes along an idyllic path. 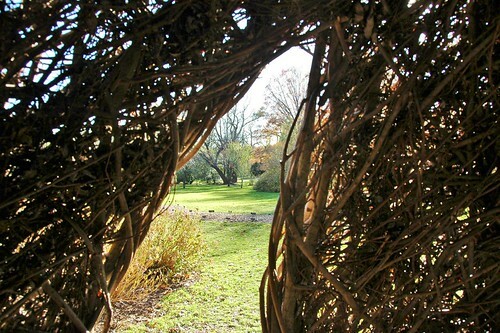 The sculpture at BBG is woven from nonnative woody material that was collected from Ocean Breeze Park on Staten Island. The harvesting site was chosen by BBG's director of Science because of its proximity to the Garden and its large population of nonnative willow (Salix atrocinerea), which is designated an invasive species in New York State. Removal of saplings of this species helped protect the site's excellent assemblage of herbaceous plants. The park is owned by the City of New York and is targeted for restoration under the City's PlaNYC sustainability initiative. 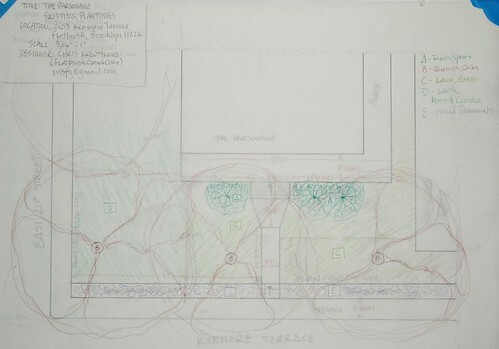 During a visit to BBG a year before beginning the work, Dougherty drew sketches and made word associations based on the feelings he experienced while exploring the potential work site. When asked about some of the words that came to mind as he contemplated what he wanted to build in Brooklyn, Dougherty smiled and said "lairs; a place for feral children and wayward adults." The sculpture will be on display until August 2011, when it will be dismantled. It's going to look awesome in snow. 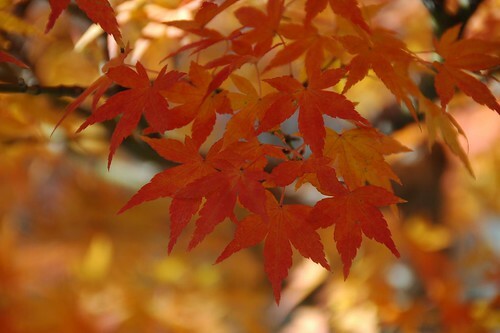 Detail of the fall foliage of a Moyogi (informal upright) specimen of Acer palmatum in BBG's Bonsai Museum. 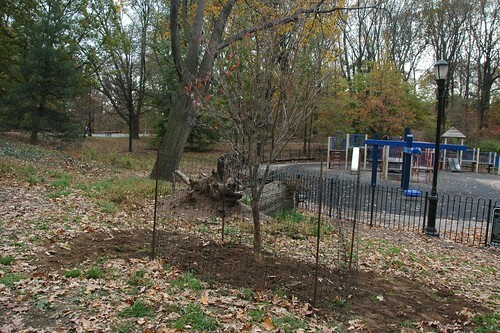 The Dogwood which my family sponsored, and I helped to plant, outside the 3rd Street Playground in Brooklyn's Prospect Park. My father's birthday was November 2. He would have been 79. He died almost two years ago, early in the morning of December 1, 2008. I've been going back over what I wrote about his death. But the best thing to read, to get a sense of who he was, is in his own words: How Old Will I Be? This morning, Blog Widow and I helped plant a tree in his memory in Prospect Park. The Prospect Park Alliance Commemorative Giving program provides opportunities to sponsor an existing tree or plant a new tree. There are no plaques or signs on the trees themselves or in the park; their Web site provides an online register, indexed by commemoration name, of the sponsored trees, their locations, and the season they were planted, going back to 1983. My father was born and raised in Brooklyn, so this seemed an appropriate way for the family to remember him. My Dad's favorite tree was the native Dogwood, Cornus florida, so that's what the family selected to commemorate him. Luis Lemus, the Prospect Park arborist who coordinated this morning's planting, told me he purchased it from a nursery in Pennsylvania. Just three days ago it was in the ground. And now it is again. Luis was joined by his Parks colleagues, Eric and Jose. The three-man crew made quick work of planting. It was all over in a little more than a half-hour. The location is lovely, just outside the 3rd Street Playground, behind Litchfield Villa. Prospect Park lost hundreds of trees over the past year, in a winter storm, and this summer's tornado-macroburst storm. A few large trees were taken down in this location, opening up the canopy. Countless thousands of park visitors, a few of whom we met and spoke with during the planting, will enjoy this tree for decades to come. Cherry Leaves, Brooklyn Botanic Garden, November 2008. For the second year, a city-wide coalition of community gardens and other groups has organized Project LeafDrop to collect leaves from residents for composting. Again this year, most of the drop-off sites are located in Brooklyn. Check the map for locations near you, and the dates and times of your preferred locations. Flatbush area residents have three exciting new options: community garden and composting sites which didn't even exist a year ago, for last year's LeafDrop! Sustainable Flatbush is collecting leaves this Saturday, November 6 and next, November 13, from 11am to 1pm at East 21st Street and Kenmore Terrace, at the site of the new Communal Garden in partnership with the Flatbush Reformed Church, the Flatbush CSA, and the Brooklyn Botanic Garden. Compost for Brooklyn, at Newkirk Avenue and East 8th Street in Kensington, and Prospect Farm, in Windsor Terrace, and also new. 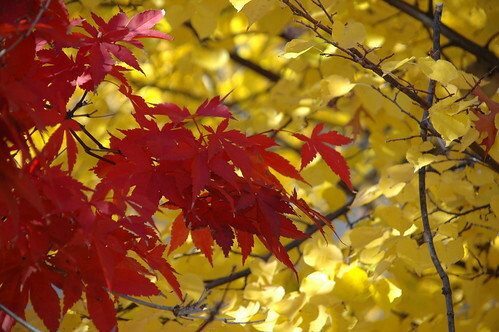 Japanese Maple leaves (red), with Linden in the background (yellow), at the corner of Rugby Road and Cortelyou Road in Beverley Square West, Flatbush, Brooklyn, November 2007. 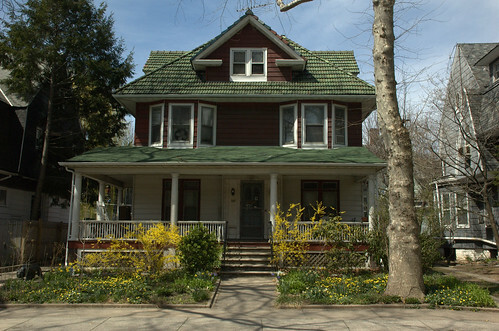 The Sustainable Flatbush Fall 2010 Street Tree Walking Tour will be this Sunday, October 24. Tours begin at 11am and 12noon. I'm proud to once again be one of your guides. Your other guide will be Sam Bishop, Director of Education of Trees NY. As in the past, tours will start at Sacred Vibes Apothecary, our other community partner. This is also listed as a NeighborWoods Month event. After a dry summer, October brought ample rains just in time to salvage some fall foliage. Dogwoods, Locusts, and Ash Trees are showing strong color. The neighborhood should be at near-peak foliage conditions for the year for the tour. This event is also listed on Facebook and EventBrite. 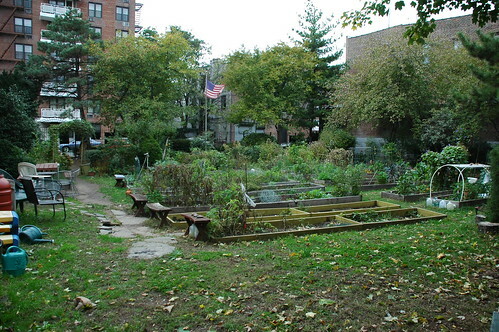 On October 2, 2010, the New York City Community Garden Coalition will convene a Town Hall Meeting to discuss the recently published "new rules" for community gardens on City land set to go into effect on October 13, 2010, as well as look to alternative legal strategies for long-term preservation. While media reports have characterized the Coalition's opinion of the rules as favorable, NYCCGC has officially held comment, ...and has been meeting with Coalition members, conferring with other greening groups, and consulting with legal experts to fully assess the scope and impact of the recently updated rules. 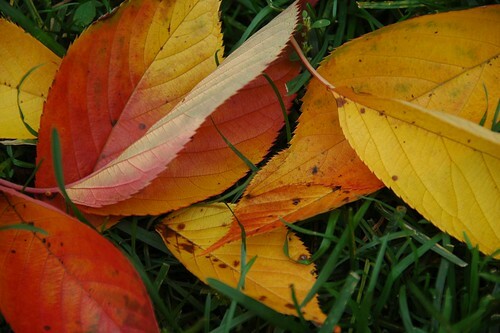 This year's autumnal or September equinox occurs at 03:09 Universal Time (UTC) on September 23. In my local time, Eastern Daylight Time (EDT), it's 23:09, 11:09 PM, on September 22. The Earth's seasons are caused by the rotation axis of the Earth not being perpendicular to its orbital plane. The Earth's axis is tilted at an angle of approximately 23.44° from the orbital plane; this tilt is called the axial tilt. As a consequence, for half of the year (i.e. from around March 20 to around September 22), the northern hemisphere tips toward the Sun, with the maximum around June 21, while for the other half of the year, the southern hemisphere has this honor, with the maximum around December 21. The two instants when the Sun is directly overhead at the Equator are the equinoxes. Update 2010-10-22: Manhattan distribution date changed. Updated 2010-10-09: Bronx distribution date and location changed. Updated 2010-09-23: Added distribution dates and sites. 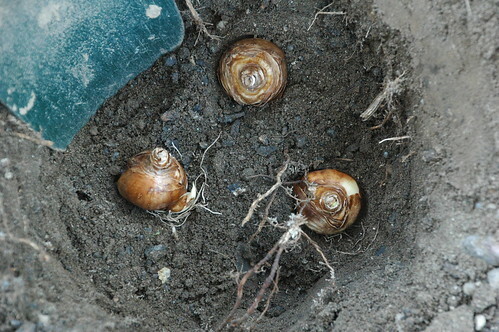 Daffodil bulbs just planted in place in a tree bed on Cortelyou Road in November 2007. Today and tomorrow are the last two days to request Daffodil bulbs from New Yorkers for Parks for this year's Daffodil Project. Bulbs will be distributed in October. In Brooklyn, bulbs will be available for pick up on Saturday, October 23, from 8am-11am, at Grand Army Plaza at the Greenmarket Manager's tent near the white flagpole. Updated 2010-09-14: Added links to news reports. Note: The full press release claims that "there are more than 600 gardens across New York City." This in incorrect. The latest census lists only 482 gardens, 20% fewer than claimed in Parks' press release. Parks Commissioner Adrian Benepe today announced the Parks Department has finalized its Community Garden Rules, which incorporate significant changes based on public comments made on the draft rules. The Notice of Adoption, including the full rules, will be published in the City Record on Monday, September 13, 2010 and take effect 30 days later. Active gardens under the Parks Department’s jurisdiction are preserved as gardens as long as they are registered and licensed by the Department. Licenses will be renewed as long as the garden satisfies the registration criteria. Parks must attempt to identify successor gardening groups for failing gardens and has nine months from time of default to return the garden to active status. 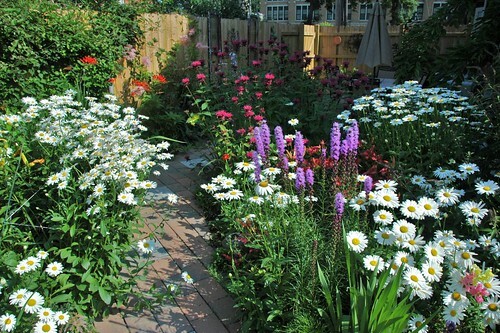 New gardens may be created and will have the same protections as existing gardens. 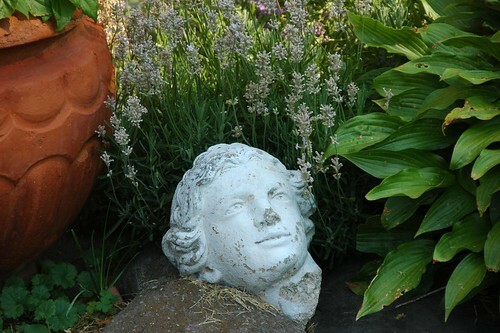 A party licensed by the City to perform work that results in damage to a garden will be required to return the garden to its preexisting condition. The Department will attempt to provide notices required under the Current Rules to gardeners in other languages. The Statement of Basis and Purpose states that gardens will be preserved and explains that the transfer and development provisions apply to abandoned and persistently non-compliant gardens under the Department’s jurisdiction. Let's get the usual question out of the way. This is where I was the morning of September 11, 2001. 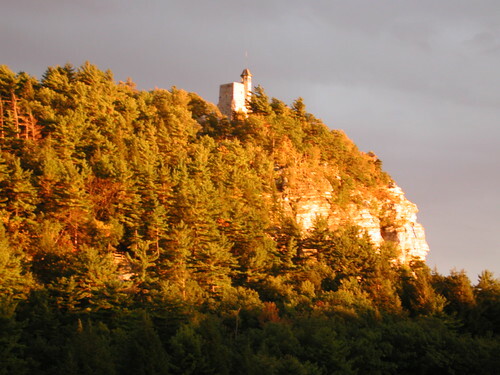 This is Skytop Tower at Mohonk Mountain House at sunset the previous night. Blog Widow and I had planned a week-long vacation upstate, starting at Mohonk. The morning of September 11, we hiked up to Skytop. A rustic retreat, Mohonk had no televisions or radios in the rooms. As we left the massive wooden structure to go out hiking, I noticed people huddled around the few televisions in some of the common rooms. I thought nothing of it at the time. I later realized we left just after the first attack. 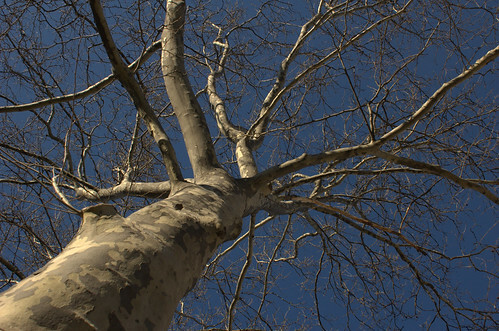 The London Plane Tree in front of my house. TreesNY's Citizen Pruner Tree Care Course is being offered in Brooklyn and Manhattan this season, covering basic tree biology, street tree identification and care. Upon successful completion of the final exam, participants receive a license that certifies them to legally prune trees owned by the City of New York. In New York City where there is limited money for tree maintenance but significant need, Citizen Pruners provide a tremendous benefit to our urban environment. The twelve hour course consists of four weekly two-hour classes and four hours of hands-on experience in the field. Participants may miss up to one classroom session. The weekend field outing is mandatory. Specific dates vary by location. Locations and Dates for classes in the Bronx, Queens and Staten Island are still to be determined. See Community Gardens: Where "Garden" Becomes the Verb on Garden Rant. Welcome, NY Times CityRoom readers. Added links to information on the 2002 settlement agreement. 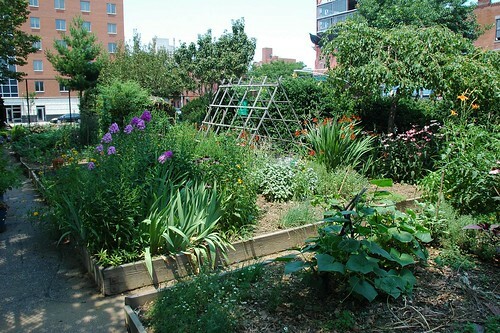 The Baltic Street Community Garden in Park Slope, as it appeared in July 2008. It was destroyed in 2009 by the NYC Department of Education. The agreement that has largely protected New York City community gardens for nearly a decade expires this September. 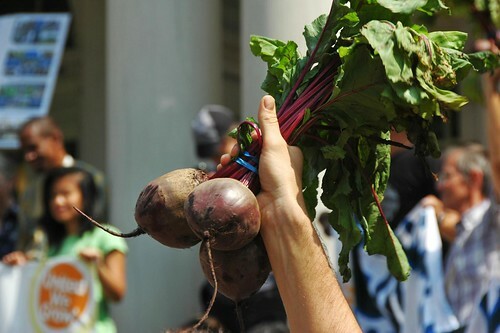 Community gardens fall under different jurisdictions, depending on whether they are in private hands, such as a land trust organization, or on land controlled by an Agency of the City. 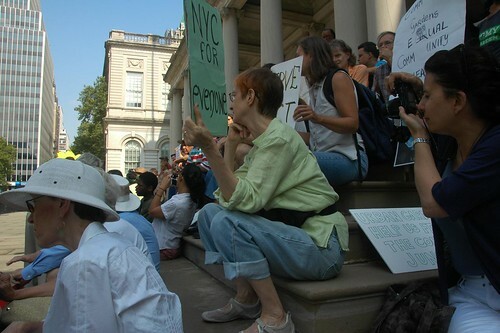 In advance of the expiration of the agreement, the NYC Department of Parks and Recreation (DPR, or simply "Parks") and Housing Preservation and Development (HPD) have drafted revised rules for governing the gardens under their care. In short: gardens will have no protection. Visit Proposed Rules on the NYC.gov Web site. For "Agency", Select "DPR" or "HPD". Click "Community Gardens" to view the Proposed Rule (PDF). Click "Comment" to submit your written comments online. There is a community meeting tomorrow evening for gardeners and advocates of NYC's community gardens to learn about the issues and what we can do in response. 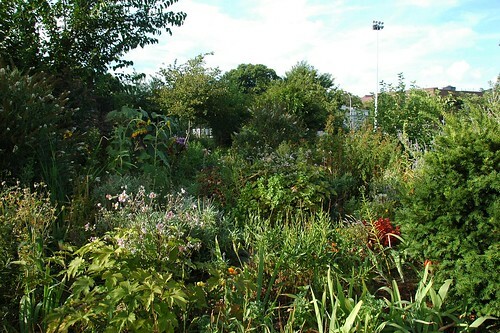 The Campus Road Garden in South Midwood, as it appeared in August 2008. It was destroyed earlier this year by Brooklyn College. Elizabeth Licata, one of the organizers and hosts of Buffa10, opened her garden for a cocktail reception for early arrivals the afternoon of Thursday, July 8, the first official event for Buffa10. As enjoyable as it was to rub shoulders with other garden bloggers, it was a real treat to visit a garden I'd only seen online. This view was familiar to me, as it was to her other readers, from her personal garden blog, Gardening While Intoxicated. I'm looking forward to this. Installation will take place from Thursday, August 5 through Sunday, August 31. The work is planned to be on display for nearly a year, through June 2011. Brooklyn, July 10, 2010—Brooklyn Botanic Garden (BBG) announces the commission of its first site-specific sculpture to celebrated artist Patrick Dougherty, whose massive constructions made of woven saplings and twigs conjure up the creations of Lewis Carroll and Andy Goldsworthy for their outsized physicality and whimsical charm. The first official event of Buffa10 was a Thursday afternoon cocktail reception, appropriately held in the Gardening While Intoxicated garden of Elizabeth Licata, one of our hosts for Buffa10, and 1/4 of the Gang of Four behind Garden Rant. 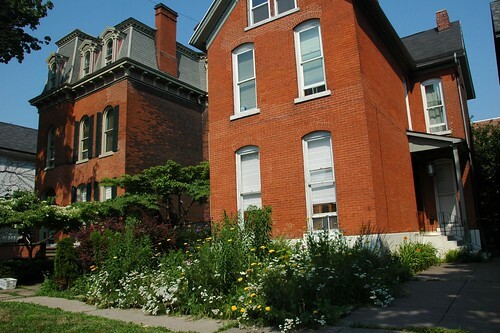 Before, during and after, we were invited to wander - the Garden Stumble - the neighborhood's streets, admire the architecture, and visit several of the gardens opened for us in a preview of Buffalo's justly famed Garden Walk, happening this weekend. For those attending Buffa10, North Pearl Street was our gateway to the architecture and gardens of Buffalo, a prelude to the abundance we would enjoy throughout the weekend. Front yards were mostly populated entirely by gardens. This front yard at 82 North Pearl Street was typically lush, with Hydrangea quercifolia (Oak-Leaf Hydrangea), Hosta, Hemerocallis, tall Lilium and Achillea, Bergenia, Lavandula, and many more species and varieties. I especially liked the use of Matteucia struthiopteris, Ostrich Fern, whose arching exclamations give movement to the garden more typically provided by tall ornamental grasses. I arrived in Buffalo on Wednesday, July 7. I wanted to take in some sights on Thursday before the Buffa10 schedule began. I found myself at the Erie Basin Marina Trial Gardens. Even though we would be visiting on Saturday, I was glad to have a prolonged visit on my own. Shortly after I arrived at the Gardens Thursday, I met Stan Swisher, one of the nursery managers there. We spent a couple hours talking about the operation, visiting the different beds. Stan showed me countless specimens, and gave me the back-story on several of them. Here, Stan shares with me the details of a double-flowered Bacopa. 2010-07-31: Added base plan, drawn to scale, of the site. 2010-07-26: Added transcribed notes from the workshop materials. On June 6 and June 16, Sustainable Flatbush and the Flatbush Reformed Church held two Community Visioning Workshops for a new communal garden to be created on the grounds of the Church. On Sunday, August 1, 3pm, we invite community review of proposed designs. Participants of the second community visioning workshop introduce themselves on the grounds of the future garden. We invite design proposals from the community. 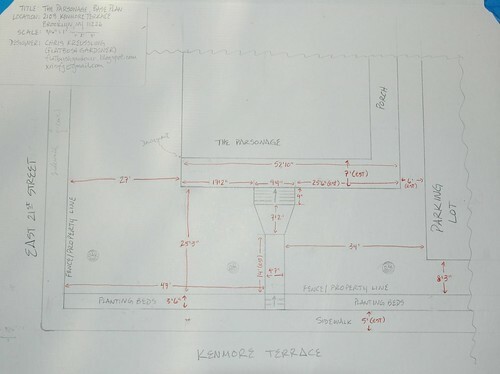 This post has basic information about the site, including measurements and general conditions, as well as the notes from the workshop sessions, to inform your designs. The main area available for the new garden is the front lawn of the Parsonage of the Flatbush Reformed Church. This building is at the corner of a dead-end court, Kenmore Terrace, and lightly-traveled through-street, East 21st Street. Here's how the site looks from the corner. Kenmore Terrace is in the foreground, East 21st Street is on the left. The view is looking slightly east of north. A panoramic view of the walled garden of the Twentieth Century Club in Buffalo, NY. Dinner Thursday evening was at the Twentieth Century Club, a Buffalo institution that had its origins in an alumni association of the Buffalo Seminary. These roots were reflected in the walled garden, a cloistered garden, where we enjoyed a wonderful dinner and company beneath the shade of a huge mature beech tree. 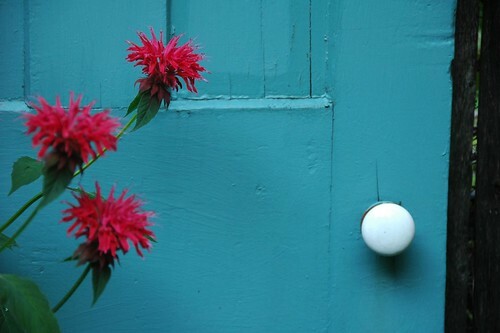 Red Monarda, Beebalm, against a turquoise blue door in the backyard of 35 North Pearl Street in Buffalo's Allentown neighborhood. This is one of the first gardens I saw in the Allentown neighborhood of Buffalo the afternoon of Thursday, July 8. Perhaps because it was first, it got extra attention. Nevertheless, I think you'll agree it was worthy of it. A simple design made practical use of a small, urban backyard. The hub and spoke design creates multiple focal points: a fountain, a chair, and the blue door. This is an important design strategy for making a small space seem bigger, part of our conversation on the "short bus" one afternoon. At the same time, it grants reliable access to most of the flowers beds for maintenance. A strong design like this works even - especially - when flowers are past and leaves are gone. And Buffalo's notorious snows would highlight it further, when it's not completely buried. 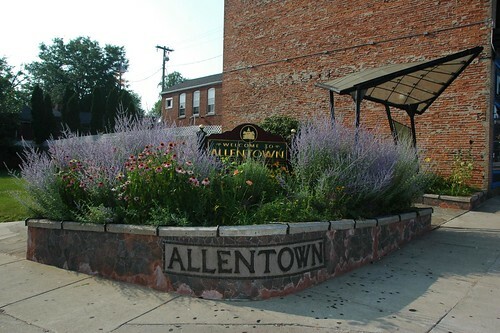 The Allentown Association Community Garden provides a gateway from Buffalo's Main Street to the quiet side streets and lush gardens of the Allentown neighborhood. What a treasure these conservatories must be during Buffalo's winters. Or on a rainy day like we had Friday. But we visited Saturday, with beautiful, if uncharacteristically warm, weather. The perennial and shrub gardens outside were also beautiful. We didn't have time to visit the arboretum. Links and placeholders for all the places I visited and saw during my stay in Buffalo. Today's Garden Bloggers Buffa10 visit to the Japanese Garden in Buffalo's Delaware Park coincided with a Celebration of the reopening of the Garden. The siting of this garden is unfortunate. NY State Route 198 slices through the Park, crossing Mirror Lake, on the bank of which the garden is situated. Even when you can direct your gaze to block out the bridge and movement of cars and trucks, the rush and roar of traffic crossing the lake is constant. Like Cary Street, The Victorian, at 200 South Elmwood Avenue, is also located just around the corner from the Buffa10 hotel. It's one of the headquarters for Garden Walk Buffalo. It's also one of the homes of AIDS Community Services of Western New York. Hidden behind the building is Hope Blooms, "a garden by, and for, people living with HIV/AIDS." A complete volunteer effort, “Hope Blooms” was built as a unique garden “by and for” those living with HIV/AIDS. Having been featured in a full page photo in the Garden Walk Buffalo Book, it is recognized as one of Buffalo’s significantly beautiful gardens. Christopher Voltz, ACS’ Director of Marketing and Special projects volunteers his weekends, all summer long, to build and maintain this garden. Clients and patients help plant the garden and its flowers are used to supply fresh bouquets of flowers to client services areas in our offices every week. This simple gesture is greatly appreciated by ACS’ clients and patients. It is ACS’ belief that a warm and welcoming environment for its clients is of great importance. Whether one is living with cancer, diabetes or HIV disease, everyone deserves to be treated with the utmost respect. These bouquets and this garden are simple ways to demonstrate this to the thousands of individuals and families we serve. Right around the corner from the Buffa10 hotel, the Embassy Suites Buffalo, is a cul-de-sac named Cary Street. I discovered it by accident when I was trying to find the entrance to the hotel when I drove into Buffalo yesterday. I missed the entrance, and pulled into the first street I found to turn around: Cary Street. The homes are detached cottages of modern construction, but in Buffalo's vernacular brick Victorian style. No two houses are alike. And most of them have beautiful front-yard gardens. Today I'm driving from Syracuse to Buffalo, New York, to attend Garden Bloggers Buffa10, the third annual meetup of North American (U.S and Canada) garden bloggers. The first was two years ago in Austin, Texas. I attended last year's Chicago Spring Fling and had a blast. Buffa10 runs from tomorrow, Thursday, July 8 through Sunday, July 11, in the middle of Buffalo's all-garden blowout, Garden Walk Buffalo, the largest garden tour in the U.S. With more than 350 gardens on display, we'll only get to visit a handful in our four days. The New York Sate Department of Environmental Conservation announced a new initiative to encourage the use of sustainable gardening and yard care practices. Be Green(sm) Organic Yards NY will provide training and licensing. Businesses complying with their practices will be able to display the Be Green logo. DEC is also enlisting course providers to deliver the training. I hope their program includes eliminating leaf-blowers. 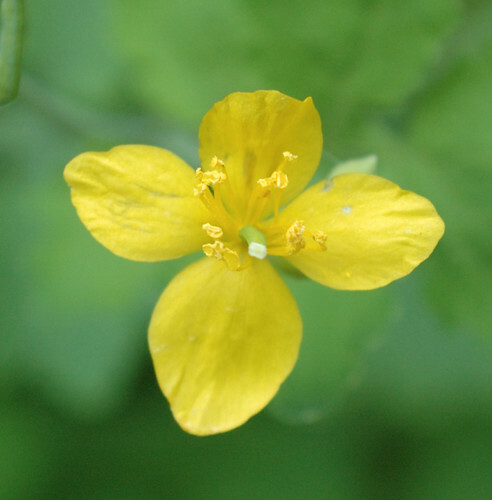 Chelidonium majus, Lesser Celandine, growing in my garden, June 2006. The plan will create the first-ever official lists of invasive species, both plant and animal, and create the legal authority to enforce controls as state regulations. The New York State Invasive Species Council today submitted its final report to Governor David A. Paterson and the State Legislature. The report, titled “A Regulatory System for Non-Native Species,” recommends giving the Council authority to develop regulations for a new process that will prevent the importation and/or release of non-native invasive species in New York’s waterways, forests and farmlands. The report, prepared by the nine-agency Council and co-led by the Department of Agriculture and Markets and the Department of Environmental Conservation, introduces a new process for assessing each invasive species for its level of threat, its socioeconomic value, and for categorizing them into distinct lists for appropriate action. Brooklyn, NY—June 29, 2010—This spring, the results of a 20-year study of the flora of the New York metropolitan region by Brooklyn Botanic Garden (BBG) found many native species locally extinct or in precipitous decline. 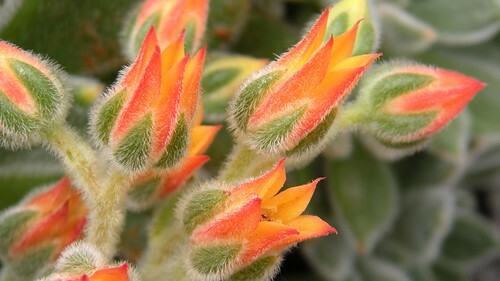 During the month of July, BBG will highlight the region’s native flora, displaying its beauty, explaining its importance, drawing attention to its plight, and providing simple ways to help in its restoration. BBG’s knowledgeable horticulturists and scientists will offer a behind-the-scenes look at the power of the native plant through field trips, workshops, and other insightful classes and lectures. In 1911, the “Local Flora Section” was the first garden to open to the public at BBG. Since then, the Garden has maintained its commitment to the study and conservation of locally native plants, most recently through its multiyear New York Metropolitan Flora project (NYMF), in which nearly every species growing within a 50-mile radius of the city was cataloged and mapped. Many of the native plants in the study—which found a significant number of species in perilous decline—are propagated in the Native Flora Garden, as the Local Flora Section is known today, in an effort to conserve them. 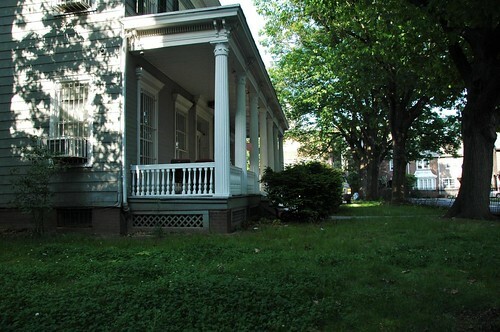 The Parsonage at the Flatbush Reformed Church is the proposed site for a new communal garden. Are you a gardener, or have you always wanted to get your hands in the dirt? Sustainable Flatbush is collaborating with the Flatbush Reformed Church to create a new community garden! Join us in a creative brainstorming session to plan this new neighborhood green space! Refreshments and childcare will be provided! * see the garden location! * learn how you can get involved! Sign up here to attend a Visioning Meeting and keep up-to-date on news related to the garden. I made this yesterday for dessert for the visit of a high school friend, whom I haven't see in some decades. Sorry I didn't take any pictures of this. Another time. I got the original recipe from a Greenmarket flyer a couple of years ago. It's one of my favorite ways to prepare strawberries. It's a great cool dessert for hot summer days. It can also be prepared hours ahead of time, even the day before, then assembled just before serving. Maceration is one of those cool, unusual words that sounds a little gross, but precisely describes what's going on. It refers to the period of letting the strawberries soak with the vinegar-sugar mixture, which blends the flavors. 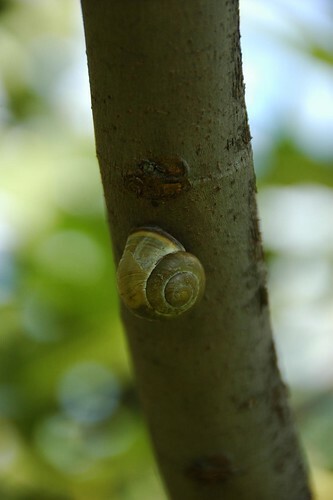 I was contacted on behalf of an urban nature educator who needs snails. 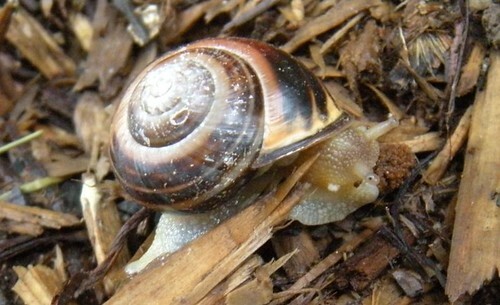 She has a project this weekend on Governor's Island to create snailariums. Who knew?! She got some snails, but not enough. Update, 2010.06.04: Added information about the site. Update, 2010.06.03: Added registration link. Thus Sunday, June 6, from 4-6pm, we'll be holding the first of two Community Visioning Workshops for a new communal garden on the grounds of the landmarked Flatbush Reformed Church. One site is a small, fenced-off area. The other is the front lawn of the Parsonage. This landmarked historic building was built in 1853 - though portions of it may be even older - and moved to this site in 1913. The main area is the front lawn of the Parsonage. It's a large area, about 25-feet deep, from the fence along Kenmore Terrace to the porch of the house, and about 85-feet long, from East 21st Street to the Church parking lot. 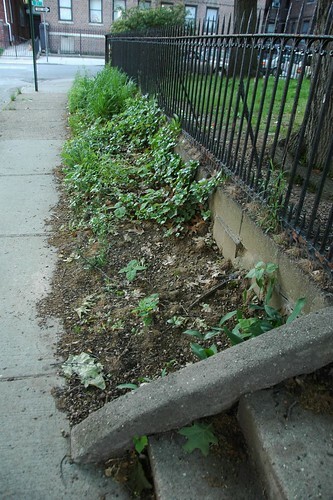 There are opportunities to further develop the buffer plantings, 3-1/2-feet between the fence and the sidewalk, that Church members have already established. 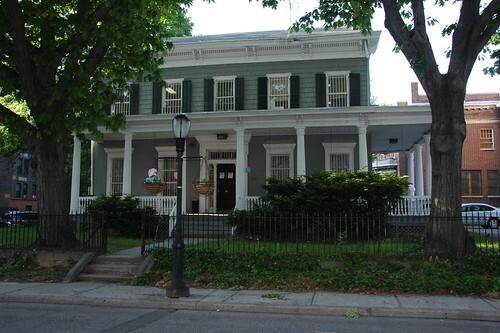 The site is dominated by large, mature Oak trees lining the fence on Kenmore Terrace and East 21st Street. These cast dense shade, and working with this constraint will be one of the challenges for designing the garden and plantings. I have a lot of experience with urban shade gardens, and see the potential in this site. Jump to How to Plant a Tree. 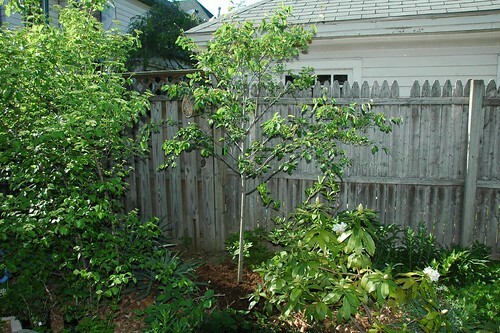 Today I planted Amelanchier x grandiflora 'Autumn Brilliance', Apple Serviceberry, in my backyard native plant garden. 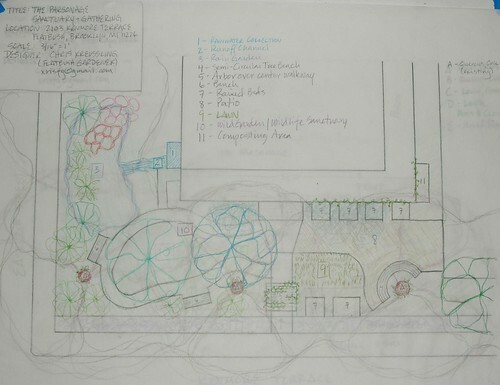 I chose my backyard as my final class project for Urban Garden Design at the Brooklyn Botanic Garden last year. Serviceberry is one of the two key plants I specified for my planting scheme. Serviceberries are multi-season plants. They bloom in early Spring, before the flowering cherries. The berries ripen in mid-summer; they are edible and tasty, and attractive to birds. Fall color is excellent. Branching structure and bark provide winter interest. 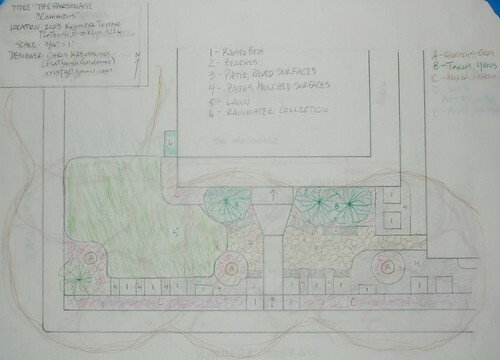 Here are the initial sketch and final design for the project. The Amelanchier is the second smallest circle on the left (north) of the plan. In this design for an urban woodland garden, the Serviceberry plays the role of an understory tree. The larger circle on the right is Sassafras albidum, the canopy tree, which is proving even more difficult to source than the Amelanchier. Tim Chambers, Greenbelt Native Plant Center Nursery Manager, and our guide for the tour, explains GNPC's history and mission at the start of the tour. The Greenbelt Native Plant Center is the only municipal native plant nursery in the country. It is a 13-acre greenhouse, nursery, founder seed and seed bank complex owned and operated by NYC Parks & Recreations Dept. Over the past fifteen years, the center has grown hundreds of thousands of specimens from locally collected seed of the city's indigenous flora for use in restoration, and replanting projects and is currently developing bulk seed mixes for the city. The GNPC is a partner in the establishment of the first national native seed bank called Seeds of Success. GNPC operates as a wholesale nursery serving primarily, but not exclusively, restoration projects around the NYC area. GNPC partners with other growers around the region. Not all their efforts go to NYC wild areas and parks; some go to other, nearby restorations, and they also receive plants of specific species when they don't have the stock to meet the demand. 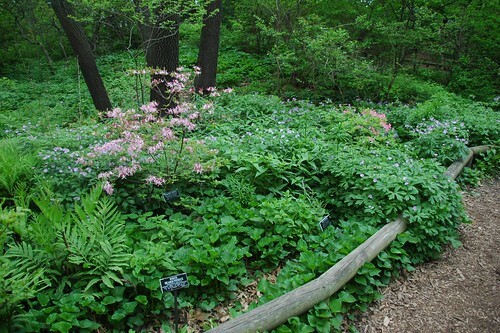 There are over 2,000 plant species native to the NYC area. GNPC currently propagates about 350, a remarkable proportion. That range is important; GNPC is not just in the business of species preservation, but also restoration of plant communities. That work requires sourcing of many different species, and the plant "palette" required depends on the goals of each project. It all starts with the collection of seed from the wild. Collections are done throughout the region; NYC itself has over 8,700 acres in 51 nature preserves under its Forever Wild program. Wherever it comes from, the seed collection protocol links back to the mission of GNPC. 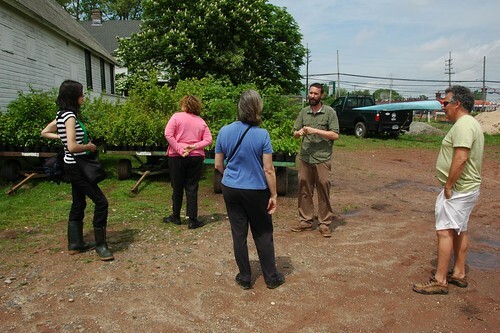 As Tim Chambers, our guide for the tour, and GNPC's Nursery Manager, explained to us, non-selection is the goal. 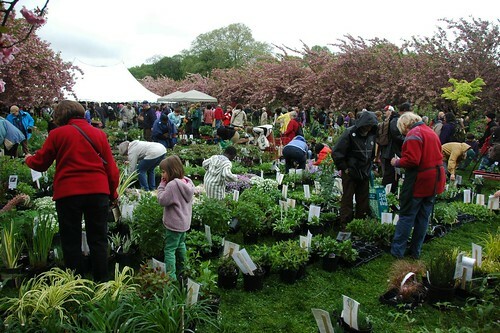 It's the week for the annual plant sale frenzy. All listed here are benefits for their respective gardens. It's a great way to support your local gardens, meet other gardeners, and pick up some cool plants. The Native Flora Garden at the Brooklyn Botanic Garden, May 2009. This was the first garden constructed after BBG was established on the site of a municipal ash dump 100 years ago, and the first public garden devoted to native plants. Next Wednesday's tour of this garden with Uli Lorimer, curator of BBG's Native Flora Garden and an instructor in their Certificate in Horticulture program, is one of over 45 FREE events in all - available during NYC Wildflower Week. NYC Wildflower Week kicks off Saturday 5/1. This is the third year for the event, and it's bigger and better than ever. There are events all over the city, including tours of locations otherwise closed to the public. I'm looking forward to visiting, for the first time, the Greenbelt Native Plant Center on Staten Island, "the only municipal native plant nursery in the country." From Friday, May 1, to Saturday, May 9, we're celebrating the hundreds of native flowers, trees, shrubs and grasses in the Big Apple. Take advantage of the spring weather, and come out for a week of environmental learning, with free activities, walks, and talks galore. I'm proud that this year, for the first time, I've been invited to participate in an official capacity. This Saturday morning, May 1, I'll be on-hand at the information booth at Union Square to help answer questions and provide information about native plants. 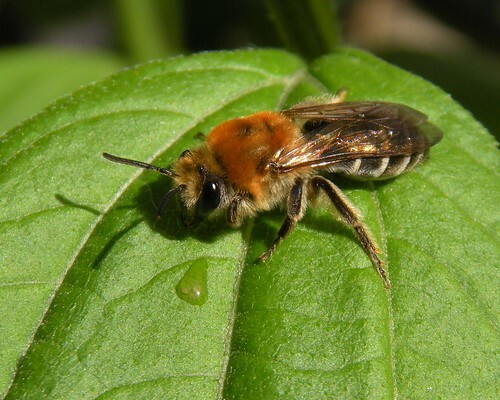 Colletes thoracicus, Cellophane Bee, is a native species of solitary, ground-nesting bees. Solitary, because each nest is burrowed out by a single queen, who constructs several chambers in which to lay individual eggs. Solitary, yet communal: where they find the right conditions, the nests can be densely packed.Here's a short video showing the activity on Saturday morning. This is the third year for what I've come to think of as "my little bees." I noticed the holes earlier last week, and saw all this activity last Saturday, as I was readying for the Plant Swap. This is the earliest in the year that I've noticed them. These bees took up residence in a "neglected" spot of the garden, one of the benefits of being a lazy gardener/ecosystem engineer. Different species of bees have different requirements. Here are some things you can do to make your garden bee-friendly. White-nose Syndrome (WNS) continues to spread north, south, and west. It was discovered earlier this year in Ontario and Tennessee. It has now also been confirmed in a Missouri cave. In mid-April, 2010, the Missouri Department of Conservation confirmed Missouri’s first signs of a new disease in bats that scientists have named “White-Nose Syndrome." The name describes a white fungus, Geomyces destructans, typically found on the faces and wings of infected bats. 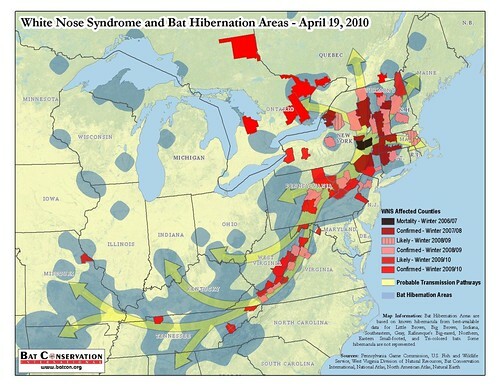 This is the westernmost spread of WNS since it was first discovered in bat winter-hibernation caves - hibernacula - in New York in the Winter of 2006-2007. This reaches far past even the discovery of WNS in Tennessee, within the bounds of Great Smoky Mountain National Park. Biologists at Great Smoky Mountains National Park have received confirmation that one Little Brown bat collected from its hibernating refuge in the Park’s White Oak Blowhole cave tested positive for Geomyces destructans [the fungus and the presumptive causative agent of White Nose Syndrome (WNS)]. White Oak Blowhole cave contains the largest known Indiana bat hibernacula in Tennessee. The Indiana bat is a federally listed endangered species which has seen declines in the Northeastern U.S. due to WNS. White Nose Syndrome has killed in excess of 90% of the bats in many of the caves and mines in the Northeast, and is just now showing up in the Southeast. 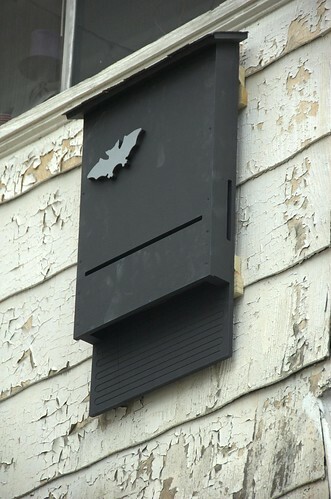 I put up my bat house two years ago in response to learning about WNS. I fear it may never receive any tenants. Without critical scientific breakthroughs on the mortality of this disease, we may see the extinction of several bat species within a decade. Mortality rates approaching 100 percent are reported at some sites. White-nose Syndrome has now moved into Canada, West Virginia, Virginia, Tennessee and Maryland. It threatens some of the largest hibernation caves for endangered Indiana myotis, gray myotis, and Virginia big-eared bats. Ultimately, bats across North America are at imminent risk. 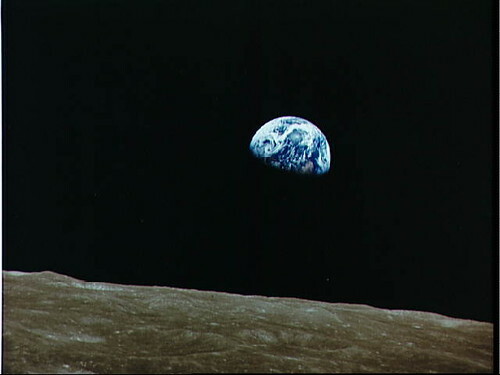 Earthrise over the moon as seen by the astronauts of Apollo 8 on December 22, 1968. This iconic image has become my regular Earth Day illustration. It was not the first image of the isolated Earth from space. It was the first which contrasted in the same image the wet, blue and green, atmospheric Earth with the barren, dusted, lifeless Moon. It is easy to deceive ourselves that we can exploit the Earth and dehumanize others - basically, sh*t where we eat and sleep - without consequences. It is hard to see, concretely and measurably, how interconnected and interdependent we are. Images like those above remind us that we are alone, isolated, and fragile. We are stewards of the Earth. We are gardeners of the world. It's our responsibility now. RESCHEDULED: The Tree Tour has been rescheduled for the rain date of Sunday, May 2, same times and location. 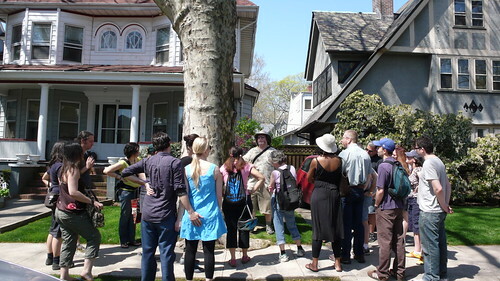 Sustainable Flatbush's 3rd Annual Spring Street Tree Walking Tour will be Sunday, May 2. I'm proud to once again be one of your guides. 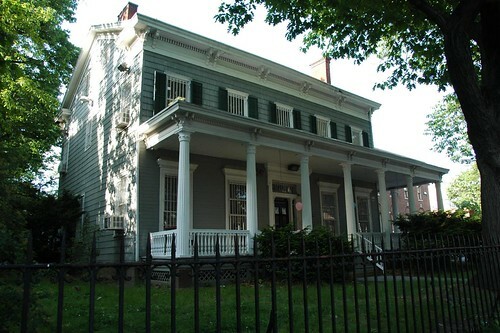 Tours start at 11am and 12noon from Sacred Vibes Apothecary, 376 Argyle Road, between Cortelyou & Dorchester Roads, and loop through the historic neighborhoods of Beverley Square West and landmarked Prospect Park South. In addition to architectural beauty, the area boasts a rich variety of street trees, as well as ornamental trees and shrubs.